Definition at line 39 of file CCopasiTask.h. Definition at line 89 of file CCopasiTask.h. Definition at line 99 of file CCopasiTask.h. 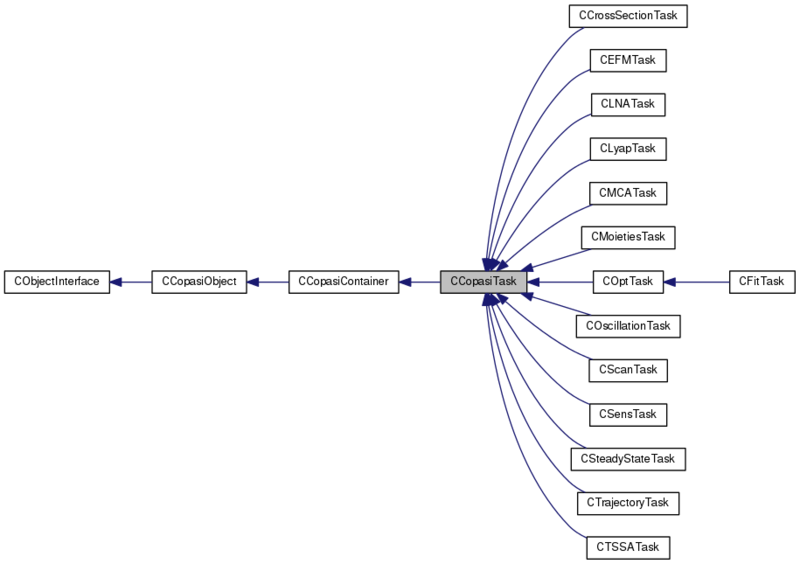 Enumeration of the types of tasks known to COPASI. Definition at line 45 of file CCopasiTask.h. const std::string & type = "Task"
Definition at line 100 of file CCopasiTask.cpp. Definition at line 120 of file CCopasiTask.cpp. Definition at line 141 of file CCopasiTask.cpp. Definition at line 161 of file CCopasiTask.cpp. References CCopasiRootContainer::getKeyFactory(), mKey, mpInitialState, mpMethod, mpProblem, mpSliders, pdelete, and CKeyFactory::remove(). Definition at line 324 of file CCopasiTask.cpp. Reimplemented in CCrossSectionTask, CLyapTask, CTrajectoryTask, CTSSATask, CSteadyStateTask, CEFMTask, COptTask, COscillationTask, CMoietiesTask, CFitTask, CScanTask, CMCATask, CLNATask, and CSensTask. Definition at line 307 of file CCopasiTask.cpp. Definition at line 196 of file CCopasiTask.cpp. Definition at line 318 of file CCopasiTask.cpp. Retrieve the key for the task. Definition at line 180 of file CCopasiTask.cpp. Referenced by CCopasiXML::saveTaskList(), CMCAProblem::setSteadyStateRequested(), and CLNAProblem::setSteadyStateRequested(). Definition at line 312 of file CCopasiTask.cpp. Referenced by CQEFMWidget::createMethod(), CSEDMLExporter::createTimeCourseTask(), CQTSSAResultSubWidget::displayResult(), CCopasiXMLParser::TaskElement::end(), CQTSSAResultWidget::enterProtected(), TaskWidget::enterProtected(), CQTSSAResultSubWidget::init(), CNewtonMethod::initialize(), StateSubwidget::loadAll(), CLNAResultWidget::loadFromBackend(), CMCAResultWidget::loadFromBackend(), CQLNAWidget::loadParameterTable(), CQMCAWidget::loadParameterTable(), SteadyStateWidget::loadTask(), operator<<(), CQSimpleSelectionTree::populateTree(), CTSSAProblem::printResult(), TaskWidget::revertBtnClicked(), CQTSSAWidget::runTask(), CQTaskMethodWidget::saveMethod(), CQLNAWidget::saveParameterTable(), CQMCAWidget::saveParameterTable(), SensitivitiesWidget::saveTask(), SteadyStateWidget::saveTask(), CCopasiXML::saveTaskList(), CQTaskMethodWidget::setTask(), CCopasiXMLParser::MethodElement::start(), and test000087::test_simulate_reaction_flux_reference_1(). Definition at line 314 of file CCopasiTask.cpp. Definition at line 201 of file CCopasiTask.cpp. Definition at line 457 of file CCopasiTask.h. Definition at line 296 of file CCopasiTask.cpp. Referenced by CCopasiDataModel::addTask(), CFitProblem::calculate(), COptProblem::calculate(), CFitProblem::calculateCrossValidation(), CQNewMainWindow::checkForElementaryModesSlot(), COutputAssistant::createDefaultOutput(), COutputAssistant::createPlot(), CSEDMLExporter::createScanTask(), CSEDMLExporter::createSteadyStateTask(), CSEDMLExporter::createTimeCourseTask(), CQTSSAResultSubWidget::displayResult(), CNewtonMethod::doIntegration(), CQNewMainWindow::elementaryModeTriggeredSlot(), CCopasiXMLParser::TaskElement::end(), CQOptimizationResult::enterProtected(), CQFittingResult::enterProtected(), CQSensResultWidget::enterProtected(), CODEExporter::exportExpression(), CODEExporterBM::exportTitleData(), CODEExporterXPPAUT::exportTitleData(), CEFMTask::getInternalSpecies(), CEFMTask::getNetReaction(), QFluxModeAnimation::getScales(), CCopasiDataModel::importSBML(), CCopasiDataModel::importSBMLFromString(), SEDMLImporter::importTasks(), CQTSSAResultSubWidget::init(), CSSAMethod::initialize(), CEFMMethod::initialize(), CFitProblem::initialize(), QFluxModeAnimation::initialize(), CSensMethod::initialize(), CEFMAlgorithm::initialize(), CBitPatternMethod::initialize(), CBitPatternTreeMethod::initialize(), CNewtonMethod::initialize(), CScanTask::initSubtask(), StateSubwidget::loadAll(), CQLyapResultWidget::loadFromBackend(), CQSteadyStateResult::loadResult(), CQCrossSectionTaskWidget::loadTask(), CQLyapWidget::loadTask(), ScanWidget::loadTask(), CQLNAWidget::loadTask(), CQMCAWidget::loadTask(), SensitivitiesWidget::loadTask(), SteadyStateWidget::loadTask(), CQFittingWidget::loadTask(), CQTSSAWidget::loadTask(), CQOptimizationWidget::loadTask(), CQTrajectoryWidget::loadTask(), CQSensResultWidget::newResult(), operator<<(), CQSimpleSelectionTree::populateTree(), Arguments::prepareModel(), CCSPMethod::printResult(), CLNATask::process(), CScanTask::processCallback(), CFitProblem::restore(), CQTSSAResultSubWidget::saveDataToFile(), CQCrossSectionTaskWidget::saveTask(), CQLyapWidget::saveTask(), CQMCAWidget::saveTask(), CQLNAWidget::saveTask(), ScanWidget::saveTask(), SensitivitiesWidget::saveTask(), SteadyStateWidget::saveTask(), CQFittingWidget::saveTask(), CQTSSAWidget::saveTask(), CQOptimizationWidget::saveTask(), CQTrajectoryWidget::saveTask(), CCopasiXML::saveTaskList(), CQEFMReactionDM::setTask(), CQEFMSpeciesDM::setTask(), CCopasiXMLParser::TaskElement::start(), test000087::test_simulate_reaction_flux_reference_1(), and SEDMLImporter::updateCopasiTaskForSimulation(). Definition at line 298 of file CCopasiTask.cpp. Definition at line 316 of file CCopasiTask.cpp. Referenced by CCopasiDataModel::addDefaultReports(), TaskWidget::commonBeforeRunTask(), CSEDMLExporter::createDataGenerators(), COptProblem::initialize(), Arguments::prepareModel(), TaskWidget::reportBtnClicked(), CCopasiXML::saveTaskList(), CCopasiXMLParser::ReportInstanceElement::start(), and test000087::test_simulate_reaction_flux_reference_1(). Definition at line 321 of file CCopasiTask.cpp. Referenced by CQSensResultWidget::saveToFile(), CQMoietiesTaskResult::slotSave(), CMCAResultSubwidget::slotSave(), CLNAResultSubwidget::slotSave(), and CQEFMResultWidget::slotSave(). Retrieve a pointer to the group of sliders. Definition at line 326 of file CCopasiTask.cpp. Definition at line 176 of file CCopasiTask.cpp. Referenced by COptProblem::calculate(), COutputAssistant::createPlot(), CCopasiXMLParser::ParameterGroupElement::end(), CCopasiXMLParser::TaskElement::end(), Worker::getIndexForTask(), COutputAssistant::getListOfDefaultOutputDescriptions(), COptProblem::getSubtaskType(), Worker::getWidgetForTask(), and CCopasiXML::saveTaskList(). Reimplemented in CCrossSectionTask, CSteadyStateTask, CTrajectoryTask, CTSSATask, CMCATask, CLyapTask, CScanTask, CEFMTask, COptTask, CLNATask, COscillationTask, CSensTask, CFitTask, and CMoietiesTask. Definition at line 207 of file CCopasiTask.cpp. References COutputHandler::addInterface(), CCopasiMessage::COMMANDLINE, COutputHandler::compile(), CModel::compileIfNecessary(), CCopasiMessage::ERROR, CModel::getInitialState(), CCopasiProblem::getModel(), CCopasiObject::getObjectDataModel(), CCopasiObject::getObjectName(), CReport::getTarget(), MCCopasiTask, mDoOutput, mOutputCounter, mpCallBack, mpInitialState, mpMethod, mpOutputHandler, mpProblem, mReport, NO_OUTPUT, CReport::open(), pdelete, REPORT, and CCopasiMessage::WARNING. Referenced by COptProblem::calculate(), TaskWidget::commonRunTask(), CMoietiesTask::initialize(), CSensTask::initialize(), COscillationTask::initialize(), CLNATask::initialize(), COptTask::initialize(), CEFMTask::initialize(), CSensMethod::initialize(), CScanTask::initialize(), CLyapTask::initialize(), CMCATask::initialize(), CTrajectoryTask::initialize(), CTSSATask::initialize(), CSteadyStateTask::initialize(), CCrossSectionTask::initialize(), COptProblem::initializeSubtaskBeforeOutput(), and CScanTask::initSubtask(). Definition at line 390 of file CCopasiTask.cpp. References CCopasiContainer::addObjectReference(), mOutputCounter, CCopasiTimer::PROCESS, CCopasiObject::ValueInt, and CCopasiTimer::WALL. Definition at line 184 of file CCopasiTask.cpp. Referenced by Arguments::getFirstScheduledTask(), TaskWidget::loadCommon(), TaskWidget::saveCommon(), and CCopasiXML::saveTaskList(). Definition at line 188 of file CCopasiTask.cpp. Referenced by CFitProblem::initialize(), CSensMethod::initialize(), TaskWidget::loadCommon(), CScanTask::processCallback(), TaskWidget::saveCommon(), CCopasiXML::saveTaskList(), and CQSteadyStateResult::slotUpdateModel(). Definition at line 89 of file CCopasiTask.cpp. Referenced by CTrajectoryTask::setMethodType(), CTSSATask::setMethodType(), and CCrossSectionTask::setMethodType(). Definition at line 331 of file CCopasiTask.cpp. References COutputInterface::AFTER, COutputInterface::BEFORE, COutputInterface::DURING, mDoOutput, mOutputCounter, mpOutputHandler, NO_OUTPUT, COutputHandler::output(), OUTPUT_AFTER, and OUTPUT_BEFORE. Referenced by CExperimentSet::calculateStatistics(), COptMethodPS::create(), COptMethodPraxis::evaluateFunction(), CCrossSectionTask::eventCallBack(), CCrossSectionTask::finish(), CLyapTask::methodCallback(), COptMethodPS::move(), COptMethodDE::optimise(), COptMethodSRES::optimise(), COptMethodSS::optimise(), COptMethodPS::optimise(), COptMethodGA::optimise(), COptMethodHookeJeeves::optimise(), COptMethodGASR::optimise(), COptMethodLevenbergMarquardt::optimise(), COptMethodNelderMead::optimise(), COptMethodCoranaWalk::optimise(), COptMethodSA::optimise(), COptMethodPraxis::optimise(), COptMethodTruncatedNewton::optimise(), COptMethodStatistics::optimise(), COptMethodSteepestDescent::optimise(), COptMethodEP::optimise(), CRandomSearch::optimise(), CMoietiesTask::process(), CFitTask::process(), COscillationTask::process(), CLNATask::process(), COptTask::process(), CScanTask::process(), CLyapTask::process(), CMCATask::process(), CTrajectoryTask::process(), CTSSATask::process(), CSteadyStateTask::process(), CCrossSectionTask::process(), CScanTask::processCallback(), CTrajectoryTask::processStep(), and COptMethodTruncatedNewton::sFun(). Definition at line 274 of file CCopasiTask.cpp. Referenced by COptProblem::calculate(), CSensMethod::do_target_calculation(), CScanTask::processCallback(), and CQTaskThread::run(). Reimplemented in CCrossSectionTask, CSteadyStateTask, CTrajectoryTask, CTSSATask, CMCATask, CLyapTask, CScanTask, CLNATask, CSensTask, and CMoietiesTask. Definition at line 277 of file CCopasiTask.cpp. References CCopasiProblem::getModel(), mpInitialState, mpProblem, mUpdateModel, CCopasiProblem::restore(), setCallBack(), CModel::setInitialState(), and CModel::updateInitialValues(). Referenced by TaskWidget::finishTask(), CLNATask::restore(), CSensMethod::restore(), CScanTask::restore(), CLyapTask::restore(), CMCATask::restore(), COptProblem::restore(), CTrajectoryTask::restore(), CTSSATask::restore(), CSteadyStateTask::restore(), and CCrossSectionTask::restore(). Definition at line 362 of file CCopasiTask.cpp. References COutputInterface::AFTER, COutputInterface::BEFORE, COutputInterface::DURING, mDoOutput, mpOutputHandler, OUTPUT_AFTER, OUTPUT_BEFORE, and COutputHandler::separate(). Reimplemented in CEFMTask, COptTask, COscillationTask, CFitTask, and CMoietiesTask. Definition at line 190 of file CCopasiTask.cpp. Referenced by TaskWidget::commonAfterRunTask(), TaskWidget::commonBeforeRunTask(), CNewtonMethod::doIntegration(), CSensMethod::initialize(), CScanTask::initSubtask(), CSensMethod::process(), CLNATask::process(), CScanTask::process(), CMCATask::process(), restore(), CMoietiesTask::setCallBack(), CFitTask::setCallBack(), COscillationTask::setCallBack(), CEFMTask::setCallBack(), and COptTask::setCallBack(). Reimplemented in CCrossSectionTask, CLyapTask, CTrajectoryTask, CTSSATask, CEFMTask, COptTask, COscillationTask, CMoietiesTask, and CFitTask. Definition at line 301 of file CCopasiTask.cpp. Referenced by CQEFMWidget::createMethod(), CQTaskMethodWidget::saveMethod(), and CCopasiXMLParser::MethodElement::start(). Definition at line 182 of file CCopasiTask.cpp. Referenced by SEDMLImporter::importTasks(), TaskWidget::saveCommon(), CCopasiXMLParser::TaskElement::start(), test000087::test_simulate_reaction_flux_reference_1(), and SEDMLImporter::updateCopasiTaskForSimulation(). Definition at line 178 of file CCopasiTask.cpp. Definition at line 186 of file CCopasiTask.cpp. Referenced by CFitProblem::initialize(), CSensMethod::initialize(), CFitProblem::restore(), CSensMethod::restore(), TaskWidget::saveCommon(), CQSteadyStateResult::slotUpdateModel(), and CCopasiXMLParser::TaskElement::start(). Resizes result matrices and updates array annotations for a specific task. For now this will be hard coded in the respective derived classes. We may introduce a more generic mechanism for this in the future. This is used when we need to know about the data structures of a task result without actually performing the task, e.g. when selecting objects for output. For now we assume that this functionality is also performed when initialize() is called. Reimplemented in CSteadyStateTask, CTSSATask, CMCATask, CLNATask, and CSensTask. Definition at line 347 of file CCopasiTask.h. Definition at line 372 of file CCopasiTask.h. Definition at line 207 of file CCopasiTask.h. Definition at line 463 of file CCopasiTask.h. Referenced by getOutputMode(), initialize(), output(), and separate(). Definition at line 202 of file CCopasiTask.h. 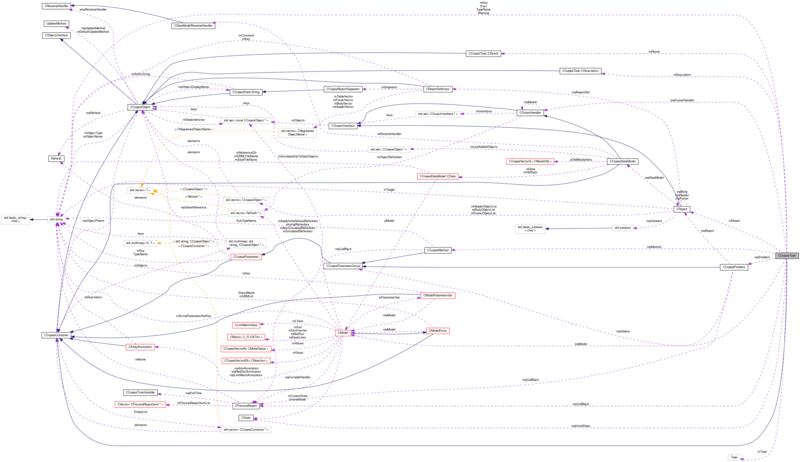 Referenced by getKey(), and ~CCopasiTask(). Definition at line 465 of file CCopasiTask.h. Referenced by initialize(), initObjects(), and output(). Definition at line 249 of file CCopasiTask.h. Referenced by CCrossSectionTask::eventCallBack(), CCrossSectionTask::finish(), getCallBack(), CLNATask::initialize(), CMCATask::initialize(), initialize(), CLyapTask::methodCallback(), CSensTask::process(), CLNATask::process(), CScanTask::process(), CLyapTask::process(), CMCATask::process(), CTrajectoryTask::process(), CTSSATask::process(), CSteadyStateTask::process(), CCrossSectionTask::process(), CScanTask::processCallback(), CTrajectoryTask::processStep(), CCrossSectionTask::processStep(), setCallBack(), and CSensTask::updateMatrices(). The state of the model before execution of the task. If mUpdateModel is false this state is restored. Definition at line 229 of file CCopasiTask.h. Referenced by initialize(), restore(), and ~CCopasiTask(). The method used to solve the problem. Definition at line 239 of file CCopasiTask.h. Referenced by CCrossSectionTask::CCrossSectionTask(), CEFMTask::CEFMTask(), CFitTask::CFitTask(), CLNATask::CLNATask(), CLyapTask::CLyapTask(), CMCATask::CMCATask(), CMoietiesTask::CMoietiesTask(), COptTask::COptTask(), COscillationTask::COscillationTask(), CScanTask::CScanTask(), CSensTask::CSensTask(), CSteadyStateTask::CSteadyStateTask(), CTrajectoryTask::CTrajectoryTask(), CTSSATask::CTSSATask(), CEFMTask::getFluxModeDescription(), getMethod(), CEFMTask::getReactionEquation(), CMoietiesTask::initialize(), COscillationTask::initialize(), CLNATask::initialize(), CEFMTask::initialize(), COptTask::initialize(), CScanTask::initialize(), CLyapTask::initialize(), CMCATask::initialize(), CTSSATask::initialize(), CTrajectoryTask::initialize(), CSteadyStateTask::initialize(), CCrossSectionTask::initialize(), initialize(), CLNATask::load(), CMCATask::load(), CTrajectoryTask::load(), CSteadyStateTask::load(), CLNATask::printResult(), CMCATask::printResult(), CMoietiesTask::process(), CFitTask::process(), CSensTask::process(), COscillationTask::process(), CLNATask::process(), COptTask::process(), CEFMTask::process(), CScanTask::process(), CMCATask::process(), CSteadyStateTask::process(), CSensTask::restore(), CMoietiesTask::setCallBack(), CFitTask::setCallBack(), COscillationTask::setCallBack(), COptTask::setCallBack(), CEFMTask::setCallBack(), CFitTask::setMethodType(), CMoietiesTask::setMethodType(), COscillationTask::setMethodType(), COptTask::setMethodType(), CEFMTask::setMethodType(), CTSSATask::setMethodType(), CTrajectoryTask::setMethodType(), CLyapTask::setMethodType(), CCrossSectionTask::setMethodType(), CSensTask::updateMatrices(), CLNATask::updateMatrices(), CMCATask::updateMatrices(), CTSSATask::updateMatrices(), and ~CCopasiTask(). Definition at line 464 of file CCopasiTask.h. Referenced by getOutputHandler(), initialize(), output(), CMoietiesTask::process(), and separate(). Definition at line 234 of file CCopasiTask.h. Referenced by CCrossSectionTask::CCrossSectionTask(), CEFMTask::CEFMTask(), CFitTask::CFitTask(), CLNATask::CLNATask(), CLyapTask::CLyapTask(), CMCATask::CMCATask(), CMoietiesTask::CMoietiesTask(), COptTask::COptTask(), COscillationTask::COscillationTask(), CScanTask::CScanTask(), CSensTask::CSensTask(), CSteadyStateTask::CSteadyStateTask(), CTrajectoryTask::CTrajectoryTask(), CTSSATask::CTSSATask(), CCrossSectionTask::eventCallBack(), CFitTask::fixBuild55(), CScanTask::fixBuild81(), CEFMTask::getFluxModeDescription(), CEFMTask::getFluxModes(), CEFMTask::getNetReactionData(), getProblem(), CEFMTask::getReactionEquation(), CEFMTask::getSpeciesChanges(), CMoietiesTask::initialize(), COscillationTask::initialize(), CLNATask::initialize(), CEFMTask::initialize(), COptTask::initialize(), CScanTask::initialize(), CLyapTask::initialize(), CMCATask::initialize(), CTSSATask::initialize(), CTrajectoryTask::initialize(), CSteadyStateTask::initialize(), CCrossSectionTask::initialize(), initialize(), CScanTask::initSubtask(), CLNATask::load(), CMCATask::load(), CTrajectoryTask::load(), CSteadyStateTask::load(), operator<<(), CLNATask::printResult(), CMCATask::printResult(), CFitTask::process(), CSensTask::process(), COscillationTask::process(), CLNATask::process(), COptTask::process(), CScanTask::process(), CMCATask::process(), CSteadyStateTask::process(), CMoietiesTask::restore(), CLNATask::restore(), CLyapTask::restore(), CMCATask::restore(), CTrajectoryTask::restore(), CTSSATask::restore(), CSteadyStateTask::restore(), CCrossSectionTask::restore(), restore(), CMoietiesTask::setCallBack(), CFitTask::setCallBack(), COscillationTask::setCallBack(), COptTask::setCallBack(), CEFMTask::setCallBack(), CSteadyStateTask::setInitialState(), CSensTask::updateMatrices(), CLNATask::updateMatrices(), CMCATask::updateMatrices(), CTSSATask::updateMatrices(), CSteadyStateTask::updateMatrices(), and ~CCopasiTask(). Pointer to group of sliders associated with the task. Definition at line 254 of file CCopasiTask.h. Referenced by getSliders(), and ~CCopasiTask(). Definition at line 244 of file CCopasiTask.h. Referenced by getReport(), CLNATask::initialize(), CScanTask::initialize(), CMCATask::initialize(), initialize(), and CSensTask::process(). Definition at line 212 of file CCopasiTask.h. Definition at line 217 of file CCopasiTask.h. Referenced by isScheduled(), CLNATask::load(), CMCATask::load(), CTrajectoryTask::load(), CSteadyStateTask::load(), and setScheduled(). Definition at line 197 of file CCopasiTask.h. Tells whether the task shall update the model with the result. The restore method must act accordingly. Definition at line 223 of file CCopasiTask.h. Referenced by isUpdateModel(), CSensTask::restore(), CLyapTask::restore(), CTrajectoryTask::restore(), CTSSATask::restore(), CSteadyStateTask::restore(), CCrossSectionTask::restore(), restore(), and setUpdateModel(). String literals for the GUI to display type names of tasks known to COPASI. CCopasiTask class. This class is used to describe a task in COPASI. This class is intended to be used as the parent class for all tasks within COPASI. Definition at line 67 of file CCopasiTask.h. Referenced by CCopasiDataModel::addDefaultReports(), CCopasiDataModel::addDefaultTasks(), CCopasiDataModel::addReport(), CQReportDefinition::CQReportDefinition(), CQOptimizationWidget::init(), CScanTask::initSubtask(), CQOptimizationWidget::loadTask(), and CQOptimizationWidget::saveTask(). Definition at line 77 of file CCopasiTask.h. Definition at line 373 of file CCopasiTask.h. Definition at line 72 of file CCopasiTask.h. Referenced by CCopasiXML::saveReportList(), CCopasiXML::saveTaskList(), CCopasiXMLParser::TaskElement::start(), and CCopasiXMLParser::ReportElement::start().